What parameters affect cylinder regularity? I'm printing cylindrical pins for a spool holder, but all my pins have irregularities on the external surface of the cylinders (see photo for partially printed pin with irregularities). It's hard to tell for sure, but it appears that the hot end will occasionally move a piece of soft plastic it previously laid down. I've tried decreasing print speed, travel speed, and layer height but I still get the irregularities. What parameters are most likely to effect cylinder regularity? This is probably a result of bad quality filament. If you haven't changed much in your setups, haven't changed slicers, but may have changed spools, then this might be the result. I would try using another spool and perhaps switch suppliers. I know it's expensive and there seems to be a stigma around it, but MakerBot Industries provides quality PLA (some ABS also). Check material requirements. ie ABS is ideal between 230-240C according to MSDS with about 110C build plate temp, PLA between 210-230C. 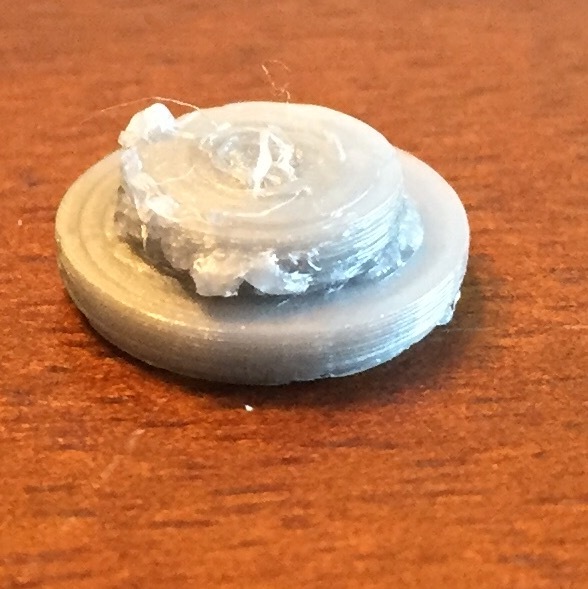 Sometimes too hot of a hotend can result in overextrusion or ooze. If the cylinder is smaller, try changing your slicing settings to have a time minimum for each layer. In my experience, a material like ABS will begin to flare out with variations in the print environment. When the material flares out, as the nozzle comes across the area again, the flared areas will be pushed aside. If you adjust your slicing settings to about 15 seconds (refer to this calculator), then the material will have time to cool slightly from its plastic state. You can cheat this slightly by adding another object somewhere further on the plate with the same height, since the time it takes to rapid to the area and print the layer might be enough time for cooling. Not the answer you're looking for? Browse other questions tagged print-quality or ask your own question. What is a good book to read about 3D printer settings? What could be causing this spotty extrusion? What is causing 'droplets' on first layer? What is causing the walls of my prints to separate? What is retract speed & length? What is wrong with my first layers?